Mike Matthews, the president of Delaware’s teachers union (DSEA), resigned this week after racist and sexist comments he made on his defunct blog —Down With Absolutes— were revealed by WHYY. After the story broke, the teachers union moved quickly to convene an executive meeting and Matthews resigned from his role as chief advocate for Delaware’s 13,000 educators. DSEA Vice President Stephanie Ingram assumed the role of president and denounced Matthews’ previous comments in an email to educators. With Mike’s quick resignation and heartfelt apology on social media today, some are ready to forgive and move on with business as usual. But here’s why his resignation is not enough. As you would expect from any powerful corporation, DSEA attempted to protect their brand in their remarks about Matthews’ online commentary. 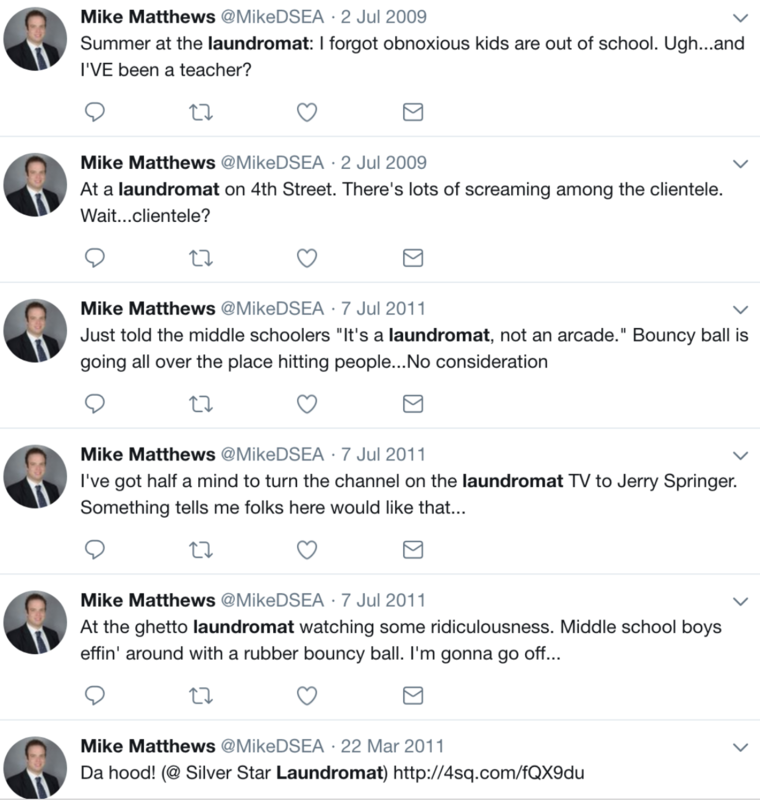 They were careful to specify that Mike’s comments occurred between 2006-2009 and that “these posts were created prior to Mr. Matthews becoming an educator and member of DSEA.” In his apology, Mike also noted that he made comments “from the period of about 2004-2009” and that he “became a teacher in 2009 after shutting the blog down several months before I started (his) job.” There are two problems with these statements. First, they are not true. Some of Matthews’ other postings that have been circulating since WHYY broke this story show that Matthews was making sexist and offensive remarks in 2010 and 2011. In 2010, he tweeted about Rep. Keeley leaning against a brick wall “with a ‘come hither’ pose and Rep. Melanie George Smith looking “pretty damn good tonight” and “wearing a tight black number.” In 2011, he talked about how “middle schoolers” at the “ghetto laundromat” might like watching Jerry Springer. DSEA and Matthews want us to believe that these comments have no connection to any deep-seated beliefs at the time and that he immediately transformed his views upon receiving his first teaching contract. But I doubt someone can spew such disgusting things at night and then simply turn the spigot off in time for first period. That leads to the second problem with this Matthews issue. Whether he made these comments a decade or a day ago, Mike’s comments online went far beyond jokes and satire. He has rightfully owned and apologized for his hurtful commentary. But I am afraid many will downplay the severity of what he said without really engaging with it. My interactions with Mike Matthews since I arrived in Delaware in 2012 give me little evidence that he still believes all the things he once posted so freely. We mostly disagree on education policy but I never doubted his focus on social justice. I think it is possible to believe he has changed and to find what he said to be enough to disqualify him from being the face of teachers in Delaware. But, if we let the conversation around Mike’s old blog end after his resignation we are missing the opportunity for some much-needed reflection. Rather than cast Mike’s comments as pre-DSEA ancient history, the teachers union should be calling for a broader conversation about misogyny, sexual harassment, and racism in Delaware’s education system. Sexual harassment and assault happens in schools too, and like the SEIU, the DSEA could be leading these conversations instead of sidestepping the commentary their leader once found entertaining. We could all just move on or we could have a real conversation about the need for better accountability and preparation in the education system. Defenders of Mike Matthews claim that he was only 22 when he made some of these comments and that he was immature and mentally underdeveloped. But they forget that in our highest-need schools a large percentage of teachers are in the first three years of their career and are 22 to 25 years old. The truth is that whatever Mike eventually transformed into during his rise from the classroom to the head of DSEA, he was once teaching students by day and demeaning women on Twitter by night. How do we address this reality that impacts students in our schools and classrooms? Finally, we need to wrestle with the “silence of our friends” that gets us to these moments. In the aftermath of the WHYY story, some who were around at the time of these comments came forward to say everyone knew about Mike’s comments and to claim they were widely accepted. Some even waxed nostalgic about the glory days when the racist, sexist, and intolerant commentary Mike offered was not policed. These silent friends now believe he is a victim of something that they potentially could have prevented with a little candor. They are joined now by the politicians, progressives, and activists on the left who have been silent about this issue. These same people would have already organized a protest had these comments emerged from a Republican leader in the state. Instead of looking away and seeking to move on, they should confront the cognitive dissonance head on. We can and should make meaningful progress after this. Or we can just accept a resignation. Thank you for fleshing this story out more fully. The more I’m learning the more horrified I feel. My reaction to the WHYY story was based on knowing Mike for the past 6 years and never having read any blogs he’d written. I agree we need to do more to address misogyny and racism in schools. I hope we can talk again soon. Thanks for speaking out and up .. what’s done in the dark will always come to the light . When light has been cast on a situation we must take action in order for change to occur . You are a tool. Stop, please. Unfortunately, Mr. Alleyne isn’t flushing out anything other than a thinly-veiled mea culpa. DSEA was already taking the lead in all those areas Alleyne suggests DSEA now take the lead on, and Mike Matthews was very effectively leading that charge in spite of his 15 year old blog posts. Instead, it seems more like a personal vendetta for Mr. Alleyne that really has nothing to do with “the kids”. After all, DelawareCan is another silly corporate ed reform group (albeit with a hefty piggy bank) that struggled to make any headway in DE, and Mike Matthew’s knowledge and leadership was a major reason why DelawareCan, can’t. -DelawareCan’t beat him on policy. -DelawareCan’t beat him in the market place of ideas. So they sat on old blog posts and released them “when the time was right” to get Mr. Matthews out of the way, followed by a lame email to DE teachers that it was an accident—which was completely unprofessional and inappropriate. At this point, it’s blatantly obvious Mr. Alleyne and his benefactors are up to no good (again) and they likely have a destructive plan for DE public schools waiting to be released in the coming days. Hope it was worth it. We’ll be waiting.